You are in a bad mood. Your dog just ate your favorite shoes. Your boss is demanding. Your best friend is having a crisis. Your last unemployment check came today. You failed a major test. You bounced a check. Your mom is being tested for cancer. A million and one things can be hitting you all at one time and as you begin to wrap your mind around all of the outcomes which could occur you go into freak out mode. You begin to doubt your ability to cope with anything. You start to feel sorry for yourself and think thoughts that are not anywhere near the truth. Ever have days like this when you feel nothing you do for anybody is good enough to meet any of their standards? Today, I went to church for a prayer meeting and I gave God all of the things that were bothering from my day and the recent past. I wrote Him a letter and released it all to Him and then I sat in silence as I listened for His answer. At first I was frustrated, it seemed as if I had been sitting there for a long time with no reply. So those not so good thoughts start flooding in. Gee, I’m not even good enough for God. This isn’t even worth it. He is too busy tonight to talk to me. All those negative non-truths just kept invading until finally when I had had enough of the voices, He began to speak to me. As I wrote out what He spoke I felt this peace invade. I felt my self-worth returning and I could clearly see that God was not too busy for me. He answered every question I had asked and more. It was like He pushed my reset button. As I was leaving the church, He said take a picture of the hangers. What? That seemed so silly to me and I asked Him why. He simply reminded me of the verse about cast your cares upon me and He was using the hangers as an illustration to get His point across. For you see, if we would just put our frustrations and failures on “hangers” and allow God to take them, we could be free to do what He asks of us. 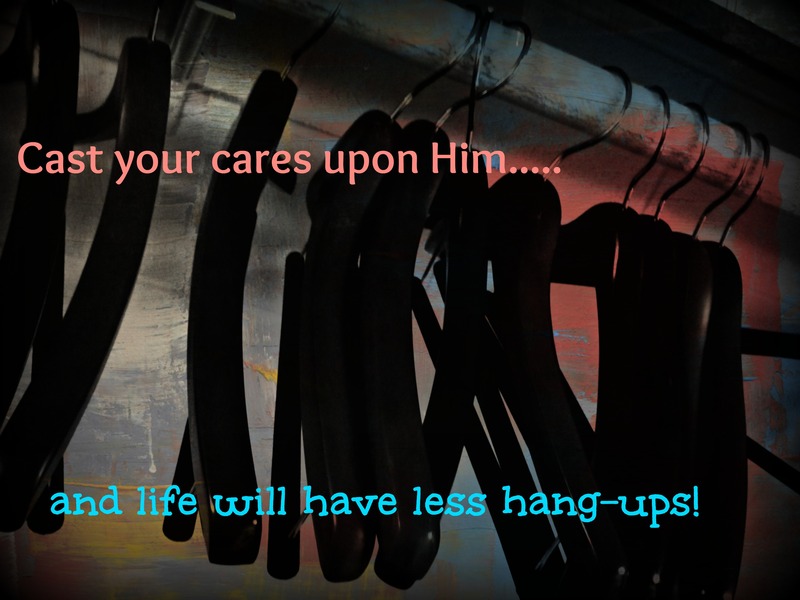 So tonight, I hang up all of my worries, concerns, disappointments and regrets on spiritual hangers and I allow God to take care of them. He has the plans for me that I cannot see. He knows I am exactly where He needs me to be in this moment of time and I can rest and remain calm knowing He will take care of all things concerning me. One other thing He mentioned to me was that He just wanted me to dance with Him and let Him lead. Of course He knows it’s hard for me when I dance not to want to lead and it was His way of saying….just let me guide your steps. Beautiful… I needed these words, thank you. Funny how God works sometimes. When He said write about hangers I thought He was crazy but as I began to write it, it made more and more sense!